Small - $33.99 Only 2 left! Medium - $33.99 Only 6 left! Large - $33.99 Only 6 left! X-Large - $33.99 Only 2 left! The candy aisle is usually a place we avoid. Why tempt yourself with humdrum candy when sweets are everywhere? You can get a mint or chocolate when you go to the bank, stroll through any office, or get coffee at a gas station. But then a switch turns on. Even before it gets cold, stores are rolling out the fall candy. Bags and bags of brightly colored, triangular formed, solidified corn syrup are piled throughout the store. Candy corn classic is a seasonal delicacy for true Halloween enthusiast. It's not trying to be fancy, candy corns knows that it's a simple, cheap way to make October's darkening days more cheerful. 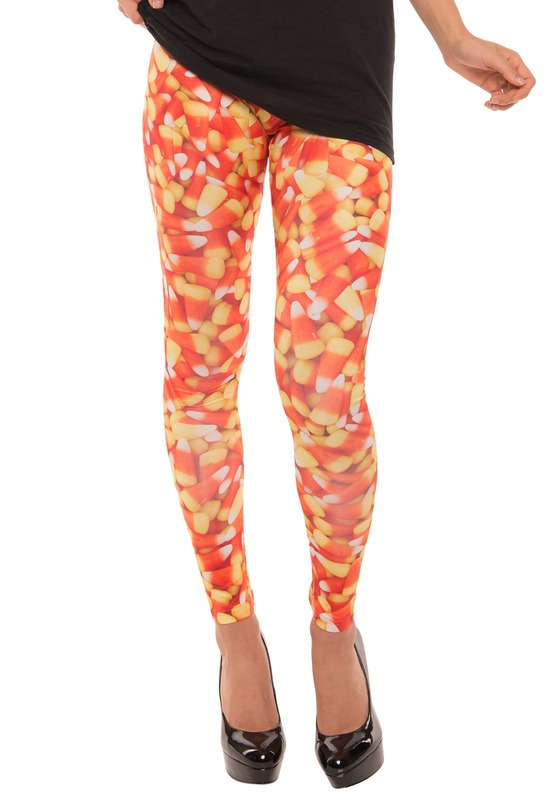 Show your enthusiasm for this humble yet heroic candy with these colorful leggings. This pair of leggings has flexible fabric and bright colors that other Halloween fans can see from far away. This look lets you stay comfortable while spreading the Halloween joy during the darkening autumn months. Wear them all throughout October or save them for top-notch costume apparel, either way, they'll look sweet and seasonal. You'll enjoy kicking back in these leggings whether you're a candy corn purist or you love an autumn with its weird fake chocolate flavored skulls and corn cobs (we're not judging, everyone has their opinions). They're the perfect item to wear to that Halloween yoga class or while handing out candy to trick-or-treaters. Just be sure to save some of those tiny triangle delicacies for yourself!